The occasion is this year's Reel Sisters of the Diaspora Film Festival, this weekend, October 24th and 25th, and the delightful subject is Jessica Williams, who will receive -- along with award-winning actress Ebony Jo-Ann -- the inaugural Reel Sisters Hattie McDaniel Award on Sunday, October 25th, at the Kumble Theater on the LIU Brooklyn campus. 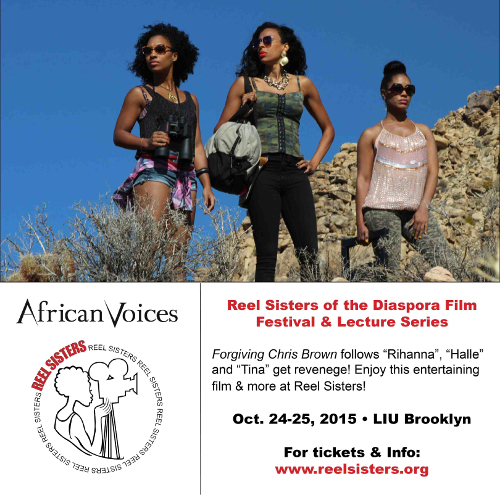 Celebrating its 18th year, Reel Sisters was founded by Carolyn A. Butts with African Voices Communications, Inc., and LIU Brooklyn, to support women of color in the film industry, and to attract cinema lovers across the spectrum, from around the world. Co-sponsored by Centric/BET Networks plus New York benefactors, and supporting women filmmakers with scholarships and other resources, the festival has screened over 400 films by women of African, Caribbean, Latina, Asian, Indian, and Native American descent, and continues to grow. As for Jessica Williams: she's terrific! The youngest senior correspondent on The Daily Show, starring on Girls and prominent with the Upright Citizens Brigade, Ms. Williams doesn't hesitate to rave up peers and mentors Shonda Rhimes, Amy Poehler, and especially her dear friend Phoebe Robinson, with whom she performs their hit monthly comedy show formerly known as "Blaria," henceforth as "Two Dope Queens." Meanwhile, I strive to impress as more than a Doctor Who/Star Trek fellow by dropping that my rave appeared on the back of the DVD case for What's Cooking, by Gurinder Chadha -- eliciting from Ms. Williams an "Oh, hell yeah! I love that movie!" for Chadha's Bend It Like Beckham, plus an enthusiastic cry of "Queen!" for name-checking Alfre Woodard. Whew. We dive right in. So first of all, have you ever been fêted at a film festival before? No, actu-- have I ever been what?! Ah. Fêted -- like, celebrated. No. Oh, my goodness! No. Except I got to go to Sundance with a film this year, and I was celebrated by my mother and my sister. They were very excited and happy. So this is my first sort of award where there are people other than my mom giving me an award -- like a really awesome award, as opposed to 'Best Daughter' award, which is what my mom would probably give me. 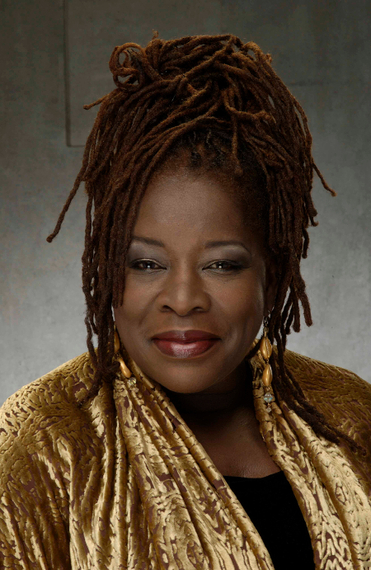 So this is amazing -- especially the Hattie McDaniel Award. Had you heard of Hattie McDaniel? I'm imagining you must have. Yeah, oh yeah, definitely, of course, yes. Especially as a young, black, female entertainer, you try and go to the beginning of our appearances in Hollywood, and she's pretty much it! As far as the roles of women of color since then, how have you felt things have changed, and what would you like to see changing more? Okay, well, firsties, I couldn't believe the time period in which Hattie McDaniel succeeded, and then got her Oscar. When I think of that it's even crazy that it happened, especially all things considered, the time and the place. So from then to now, I think things are changing a bit. I know there's still a diversity-in-television-and-film topic that is brought up, and with good reason. But I say this because I'm now performing at colleges, and I like to tell the students that I feel like now is a great time to be a young black woman, or a Latina woman, or a gay, lesbian, bisexual, transgender -- a woman, however you identify. Just because the stories that have not been diverse -- they've been done for like the last 100 years! And it's old. It's tired. It's boring. Who wants to sit and see another romantic comedy about a clumsy, straight, white woman who is stepped on at work, and who just wants to date this guy that she ran into serendipitously at, like, the mall, or something, and she can't find him, so the whole movie's about that: that's boring! And I think now, with where we are in 2015, there is a call, social media-wise, where everyone is able to connect for more interesting, beautiful, and unique stories. I'm honored to have had a successful run on The Daily Show. Women stop me all the time, and they say, "Hey, thank you so much for this catcalling segment," or, "Thank you so much for this segment." They are really just grateful to hear four and a half minutes of something that isn't discussed -- because we're listening to the same old, boring stories. Do you feel that there are ways that the machine can be improved from within? Well, in the sense of development, getting stories through -- because social media is kind of everyone's media, but there's still an industry that needs tinkering to improve it and add diversity to it. So what would you like to see? I think it's going to take some -- and I use this in quotes -- "risks" from people that are already in Hollywood. They're going to need to shake up what has been done. A lot of the problem is they don't want to take risks. Oftentimes, people tend not to try and reinvent the wheel, but re-do the wheel. And so I think by casting a bisexual person, or a transgender person in a lead role, that is shaking things up. I think there's some fear there. I think it's going to take just a little bit of bravery. It's going to take a little bit of being open-minded, and thinking outside the box, to give people that are not a straight, white male a chance. The most innovative people, the game-changers, the people that want to work, are often times people that shake things up a little bit -- and show things from a different perspective. So it's gonna take people in the industry who want that to happen, in order for things to change internally. That's excellent. How is comedy useful as a tool for getting people's attention, and getting new ideas across? I'm not sure. I'm still figuring that out. Comedy is very personal to each comedian, and I think it's very personal to every writer. So I think: when a person is truthful -- whether it's art, or film, or music -- I think if they're truthful, and if they say what they feel, they're going to put it out in the world, and they're not the only person that feels that specific thing. It touches people -- whether it is a song, or comedy, or writing; I think that's just art. I think that we are sometimes egocentric in thinking that we are the only person on the planet that feels a particular way. But really when we put stuff out there, we find that it connects and resonates with people on different levels. That's definitely what Patrice [Bradshaw: Reel Sisters' Lecture Series Director] and the group with Reel Sisters are going for as well. They're fairly revolutionary in that they are the first women of color-oriented film festival in Brooklyn, ever. Which is kind of unusual, you know, you'd think it would have happened earlier. Yes! Of course! Sometimes it's because: "Nobody's gonna make that award for us. We have to make that award for ourselves" -- which is why Reel Sisters is amazing. Patrice is great -- I've been talking with her about it in the background a little bit. Yeah, and: what a trooper! I mean, it's such a huge amount of work to put something like this together. Cool. And lastly, what kind of stories would you like to see more in the forefront of entertainment? Oh my gosh, oh my gosh -- more stories about gay, lesbian, bisexual, and transgender people. More stories about women of color: black women, Asian women, Indian women, like seriously -- any sort of woman I want to see. That's just what I want to see, because everything else is boring. (laughs) I just want to see the stories. You know, when you go and you sit down and you watch movie previews, and it's always like (Jessica puts on a credible "Trailer Guy" voice): "In a world...where a white dude...is just alive, trying to figure it out..." That's, like, what?! Let's see something else! Because there's like seven previews of the same thing! It's just like: Let's see something fun, and new!